Mark D. Uhen is an Associate Professor of Geology at George Mason University, and Associate Chair of the Department of Atmospheric, Oceanic, and Earth Sciences. Dr. Uhen’s research focuses on the origin and evolution of cetaceans (whales and dolphins), major evolutionary transitions in general, functional morphology, use of stratigraphic data in phylogenetic analysis, and theoretical aspects of diversification. He has published many papers in scientific journals, contributed chapters to edited books, co-authored a book on the evolution of whales, and presented at numerous scientific conferences. 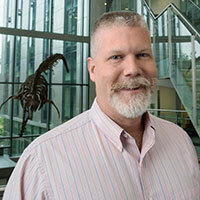 Dr. Uhen is also a Research Associate at the United States National Museum of Natural History, and the Chair of the Executive Committee of the Paleobiology Database. Dr. Uhen’s research focuses on the origin and evolution of cetaceans (whales and dolphins), major evolutionary transitions in general, functional morphology, use of stratigraphic data in phylogenetic analysis, and theoretical aspects of diversification. He has published many papers in scientific journals, contributed chapters to edited books, co-authored a book on the evolution of whales, and presented at numerous scientific conferences. Also visit the Paleobiology Database and the EarthLife Consortium.